(Newser) – Some 85 Hanjin ships carrying up to 24 crew members each are now stranded around 50 ports in 26 countries over fears the company can't pay port fees—and food and water supplies are dwindling, per Bloomberg. 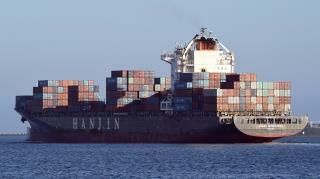 "Our ships can become ghost ships," says a rep for Hanjin’s labor union. At least $90 million is needed to allow ships to unload cargo after the South Korean shipping giant filed for bankruptcy protection last week; cargo handlers and others are refusing to unload the cargo over fears they won't get paid. Hanjin Group—a conglomerate including Hanjin Shipping and Korean Air—says it will supply that amount using $36 million from Chairman Cho Yang Ho's personal assets and $54 million borrowed using its stakes in overseas terminals as collateral, reports the Guardian. Amazon is starting its own fleet of planes to deliver products: Prime Air. Samsung and HP can afford a shipping tanker of their own.